The Moleosaurus (Dinosaurum talpa) is a monster that likes holes. Natural holes, holes made by heroes, all kinds of holes. Heroes who encounter the moleosaurus can expect an epic fight from this Big Bad Boss monster. It's been clinically proven by The Powers That Be (DON'T question it!) that heroes cannot defeat this daunting creature one on one. As seen in the image at right, Goldar The Space Giant is the only person to ever single-handedly defeat the moleosaurus. In fact, the moleosaurus had to come to Godville after being vanquished by Goldar. 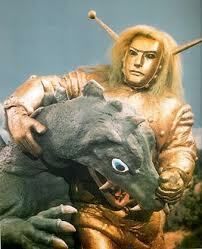 Goldar is a 50 foot tall robot. Your hero cannot compare to the awesome might of a Space Giant, so make sure to team up! This page was last edited on 3 January 2019, at 13:34.